Published on August 8, 2010 in Culture, General T&T, Politics and Weather. 11 Comments Tags: Disaster, Flood, Politics, Raffique Shah. HEAVY rainfall, like that which we experienced last Monday, is an act of nature. Heavy flooding, which we have repeatedly been subjected to over the past two decades, is caused by a number of factors. Many of these are beyond man’s control. But governments and citizens must shoulder much blame for some of their actions, or inaction in instances, that add to the hazardous mix of factors that return to haunt us all, especially during monsoon-type weather conditions. Published on March 28, 2010 in Culture, USA and Weather. 7 Comments Tags: American, fashion, Kwame Nantambu. 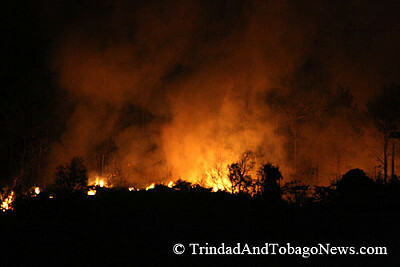 “Good news, good news, good news”, “ring de bell”, climate fashion change has finally hit the shores of T&T. To all intent and purposes, the Republic of Trinidad and Tobago has now moved out of tropical meteorological zone into the temperate zone, not by accident but by calculated design. Works and Transport Minister Colm Imbert says the ultimate solution to the flooding that has been experienced by those who live close to river banks in flood prone areas may be to have them relocated. KINGSTON, JAMAICA: Hurricane Dean pummelled Jamaica with gusting winds and torrential rains yesterday after the prime minister made a last minute plea for residents to abandon their homes and head for shelter. Many residents ignored the call, however, while tourists holed up in resorts with hurricane-proof walls. The Cayman Islands may be spared Hurricane Dean’s 150 mile-per-hour winds as the storm heads toward Mexico’s Yucatan Peninsula after battering Jamaica. Residents in Jamaica were today faced with the devastation caused by Hurricane Dean. 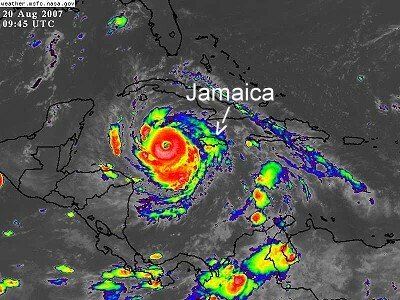 Jamaica received a severe battering from the first hurricane of the Atlantic season but appeared to have escaped the worst after Hurricane Dean whipped past the island’s southern coast overnight. The storm hit Kingston, the Jamaican capital, with winds of up to 150mph, downing power lines, ripping off roofs and blocking roads with debris before spiralling off into the Caribbean in the early hours. But the only casualty appeared to be a man reported missing after falling trees crushed his house and there were no reports of any injury to the thousands of foreign holidaymakers on the island. As Hurricane Dean crashed into Jamaica yesterday, Trinidadians living in that country were bracing for the worst while Government assured that a helping hand would be extended to the Caribbean neighbour.